In a joint record for the competition Liverpool were crowned eventual winners against Middlesbrough last night after the penalty tally read 14-13. A phenomenal end to a difficult night for the Reds who looked to have sealed things with a Suso goal late on only for Raheem Sterling to make a terrible pass, forcing Kolo Toure to concede a penalty. Brendan Rodgers as expected started with a very different line up. Rickie Lambert lead the line with youngster Jordan Rossiter given his debut in midfield. Despite the assumption Boro would field a full starting XI manager Aitor did make several changes. The game got off to a good start for Liverpool who only took nine minutes to convert. Attacking play from both teams eventually led to a break for Liverpool. 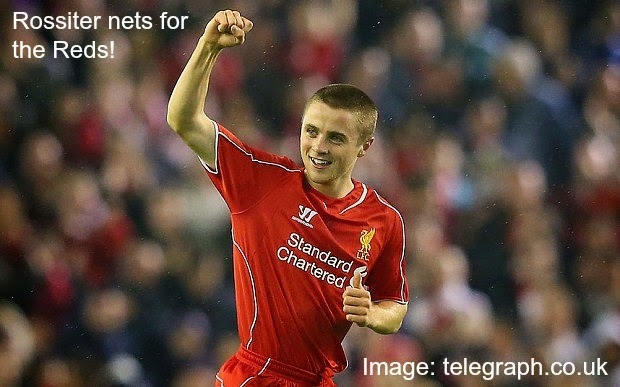 Youngster Jordan Rossiter was awaiting outside the box and with a sweet strike sent his effort to the left of goal past the Middlesbrough keeper Blackman. Finally, the Reds can chalk up a victory in the Premier League under boss Brendan Rodgers and in some style too. Rodgers after clearly being impressed by some of his youngsters filtering through the side went for a rather different starting XI against Norwich on Saturday, add to this that Suarez was on song, it was a comfortable victory for Liverpool with the only downside being that they conceded. Rodgers gave Suso and Wisdom their first Premier League starts whilst opting to play Raheem Sterling once again. Also included was Sahin who scored two against West Brom in the league cup. Possession according to the BBC ended up 50/50 after the 90 minutes but vitally for Liverpool this time they had maintained their portion of the ball and made sure they hit the back of the net at the same time. Liverpool took on Steve Clarke's West Brom at The Hawthorns on Wednesday night and despite things not immediately going to plan the Reds very youthful side eventually managed to calmly and confidently win the game and take their side through to the next round of the Capital One Cup. Brendan Rodgers made eleven changes to the team that lined up in front of Manchester United and the majority of that eleven were academy products. After the success of Raheem Sterling in the first team and the glimmer of Suso during the Manchester United game it is clear the boss is not afraid to put his faith in the younger lads. Carragher was easily the most experienced for Liverpool but Downing and Henderson also added some support for the rest of the side.